Everyone loves Symphony of the Night. Good pacing, solid gameplay, great art, and music that’s still some of the best in the series. Even outside of just being a fun game, there are plenty of secrets of extras that give you a reason to play again. Even so, there’s only so many times you can play a game over the course of 20 years—and people always want more. 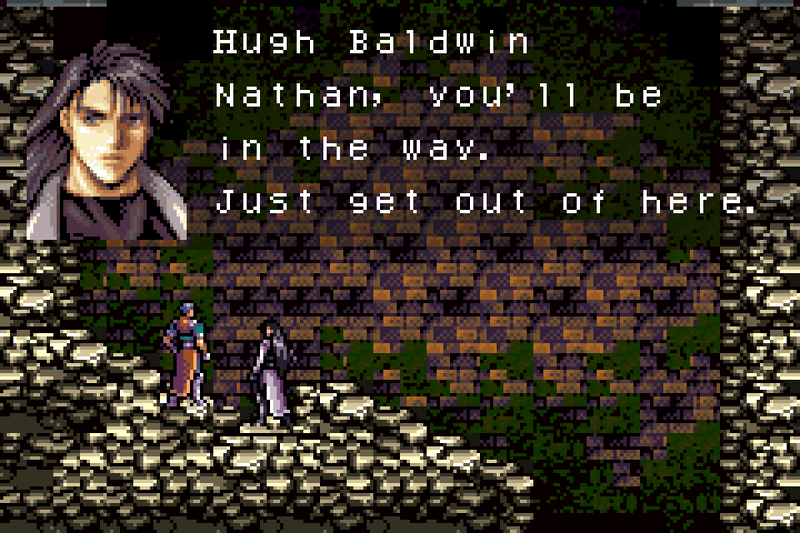 That’s what led me to Castlevania: Circle of the Moon. I’d recently discovered the wonders of the Game Boy Advance, and after watching that abomination 2017’s Castlevania on Netflix, I felt like trying a Castlevania game I’d never played before. Loading up the options for Game Boy Advance, I quickly realized that there’s a reason Aria of Sorrow makes everyone’s “Top 20 Game Boy Advance Games” lists while Circle of the Moon is conspicuously absent. In fact, I could think of 20 reasons not to like the game. Michael. The game starts off with some painfully slow exposition, followed by a poorly written fanfic. 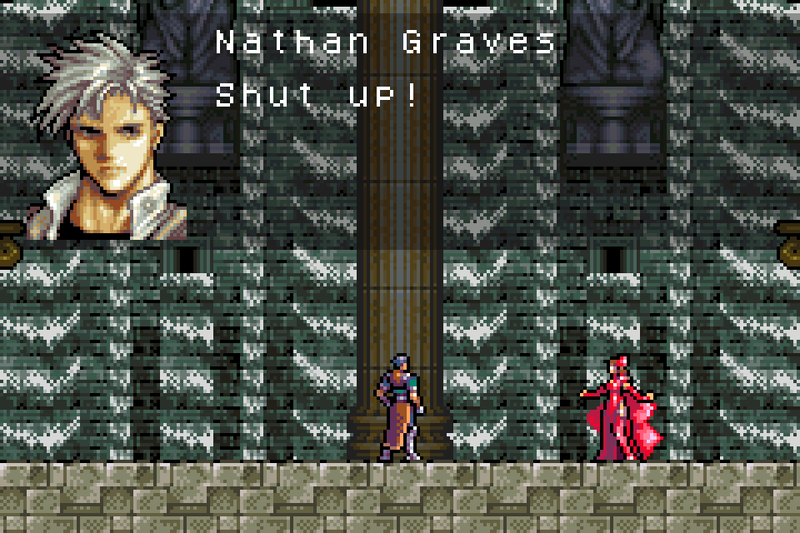 Dracula and Camilla are busy trying to out-goth each other when they’re interrupted by an all-OC boy band. There’s some stilted text to explain that no, really, these are definitely characters you should care about, and then you fall down a pit. Nathan and Hugh as they fall. Actual footage from the opening cutscene. There is no story beyond that. You’re just some original fan character a completely legitimate official character with a whip. 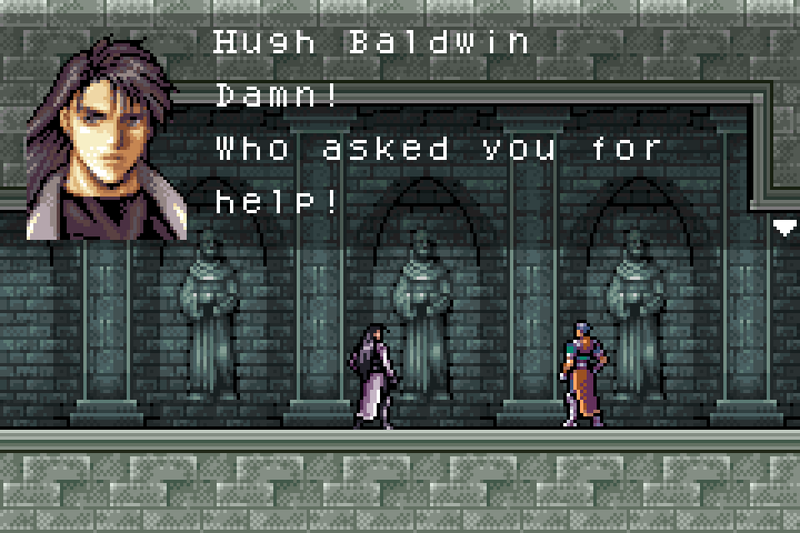 Who’s not a Belmont. 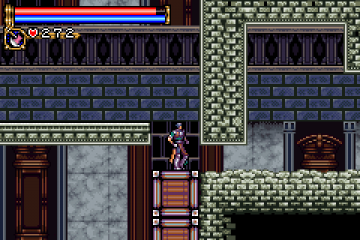 You explore Dracula’s castle with no real direction other than “let’s follow this path until we reach a dead end”. When you get a new ability, like double jump or that thing what lets you break rocks, most newly opened paths will literally immediately bring you to another dead end. I’m looking at you, weird exploding sarcophagus things. Was the “hours of gameplay” stat on the back of the box too low? 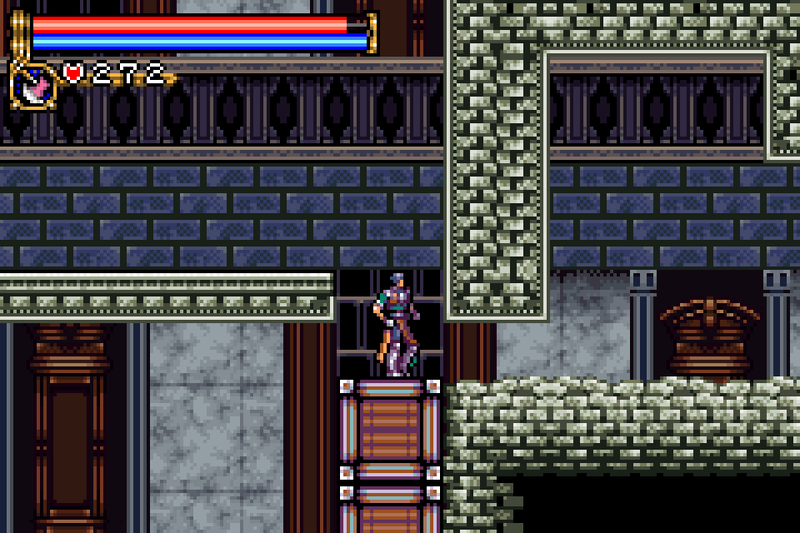 Most of the game is just running through hallways filled with the same set of enemies three or four times. 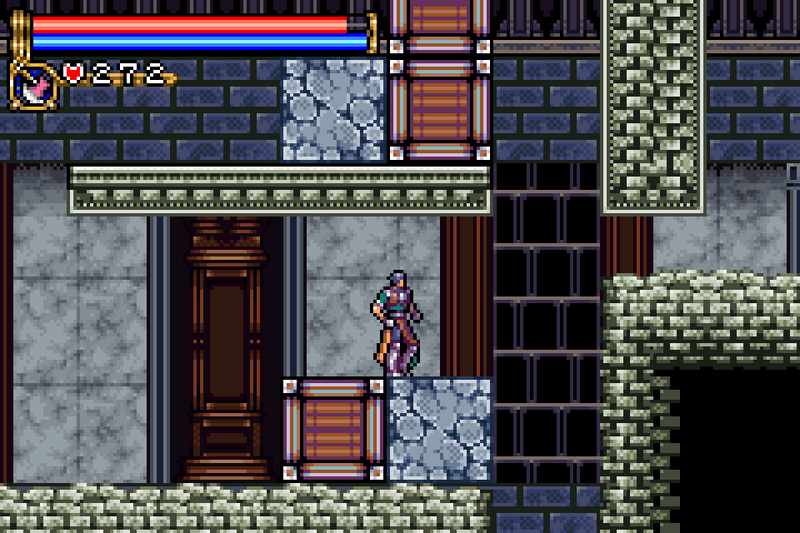 And I mean that in both ways it could be read: There are hallways where the same set of enemies is repeated multiple times, and you have to run through said hallways multiple times as you backtrack through the castle trying to figure out where you’re supposed to go. It got to the point where I’d just jump over all the enemies because couldn’t stand stopping to fight yet again, but then I’d end up underleveled when I got to the boss and have to go back and grind. Actually, there is a small iota of story in the game, but it’s more like flavor text than guidance or call to action. Every once in a while, you’ll run into Hugh—you know, the guy from the beginning? No, not him, the other one. No, not the main character, the other one. Well, he’s still around, and he shows up to say some important things sometimes. The writing in this game. The character development! The depth! The wit! The intrigue! Seriously, there’s nothing to go off of in this game. There’s no mystery: From start to finish, you’re just trying to figure out how to get into the room where you know Dracula has the old guy, whatever his name was. There’s no twist. 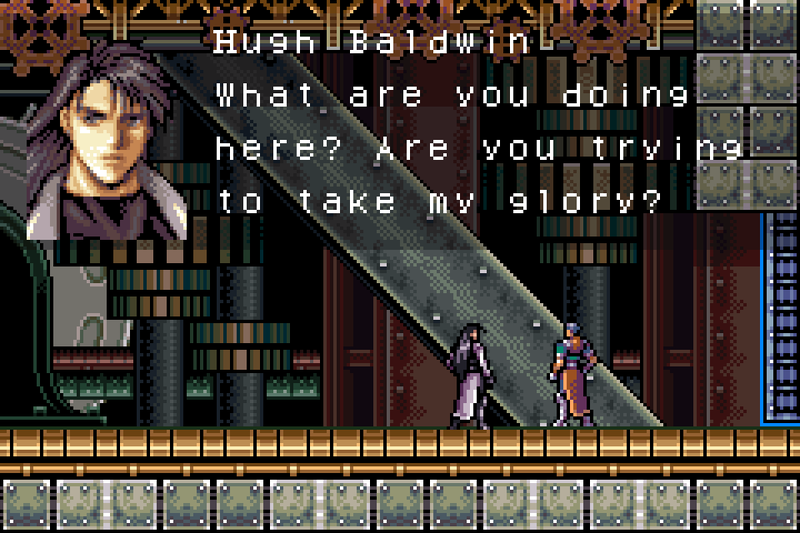 The B plot is Hugh’s temper tantrum, and you’re left to figure out how to save Morris on your own. … Morris. The old guy. 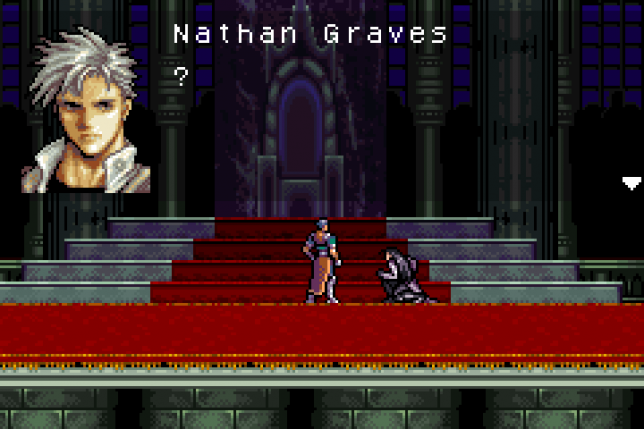 You saw him that one time during that one cutscene. No, he’s still around, you just don’t see him again until the end. Luckily for you, Dracula just missed the full moon and has to wait a few weeks before he can “perform the rite”, as the kids call it these days. That gives you plenty of time to run around the castle Scooby-Doo-style, occasionally running into Hugh while he cries that the old man likes Nathan better. Speaking of the story, I have to question the text in this game sometimes. There’s nothing that specifically calls out “bad translation”, but the dialogue is written so straight and the pacing is so plodding that it enters uncanny valley territory. Is there more in the original Japanese that we’re just missing, or is the writing just terrible? Alright, fine! I’ve complained enough about the game. I guess the game isn’t all bad. The art is pretty good for one thing, and while there’s only a few songs you ever hear, I didn’t have reason to turn the volume down. I also have to give them some credit for trying to change things up a bit. They dropped the money concept, which is a needless feature in most Castlevania games that implement it, and I liked what they were going for with the card system. The main drawback is how much grinding it takes to get cards, but I liked the idea overall…even if only four or five card combinations were actually useful. Alright, maybe there wasn’t that much to like about it. But they tried! My next complaint I guess is up to personal preference. 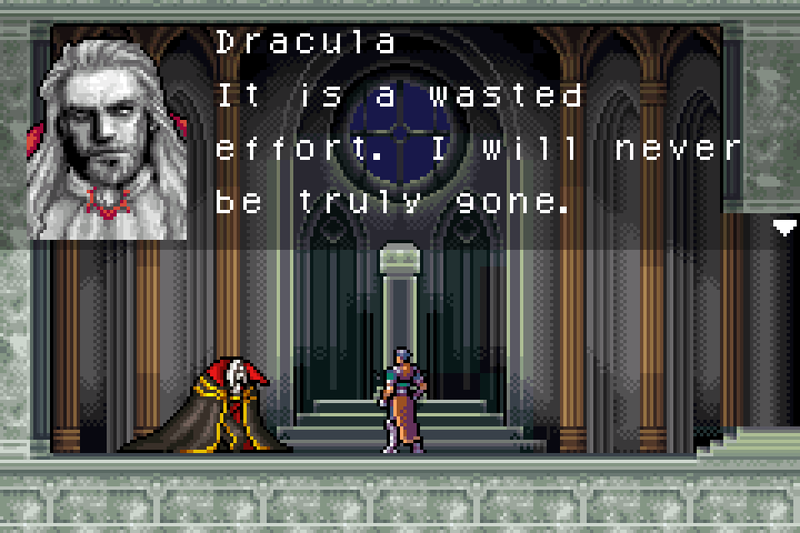 I’ve heard that for purists, Symphony of the Night is too twitchy. 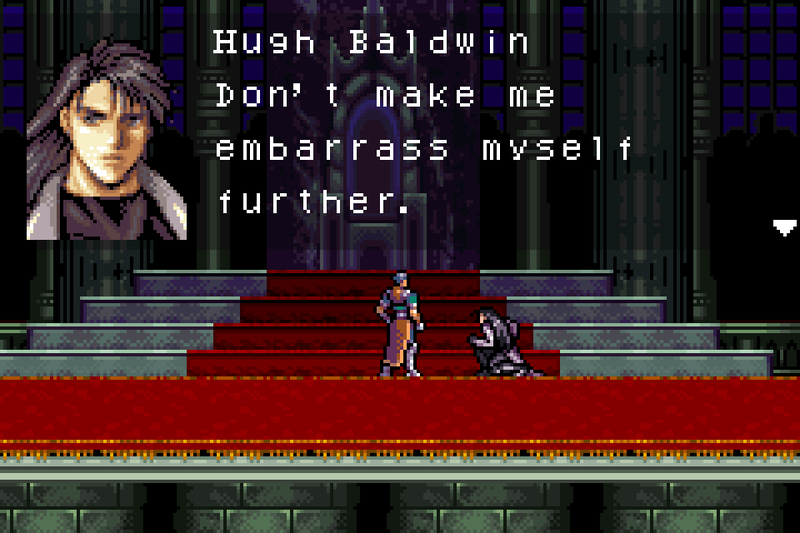 Alucard moves too quickly and responds too fast. 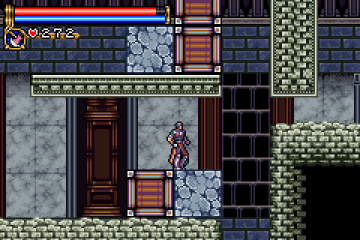 The original Castlevania titles are about planning, and knowing where your whip will be three or four frames ahead of time instead of mashing buttons and expecting instant results. Circle of the Moon is a bit of a return to form in that respect, but it gets kind of caught in between, leaving the controls feeling clunky. 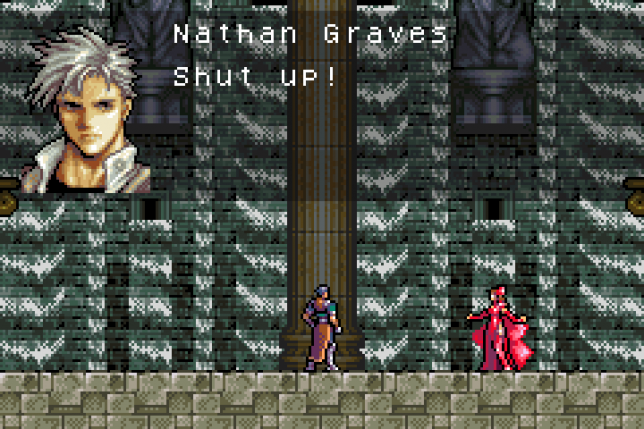 Maybe I just prefer more of an “action” game, but I found myself yelling at Nathan during boss battles. Turn around, you dope! Wait, jump! Not NOW…oh, come on! What, was I not touching the ground when I hit the spell button?! And I haven’t even gotten to the box-pushing puzzles. I wouldn’t have minded them so much if they weren’t painfully slow, and they’re just kind of tacked on near the end of the game. There are no other puzzle aspects before that…they just added like three whole box puzzles and called it a day. Sorry, Konami, this doesn’t qualify the game to be a “puzzle platformer”. Overall, the game is just kind of there. It’s playable and beatable…but why? You don’t learn anything. You don’t experience anything. There’s nothing new about the Belmont family because they mysteriously don’t appear in this OC-insert fangame. It’s not particularly fun. The only cool part—the DSS card system thing—is never picked up by any of the other games in the series. In the end, I beat the game…it’s over and done with. Maybe now I can move on. What do you think, Dracula? XBL Indie Games: Zombies, Decapitations, and More!